The vision shared by Julie and Françoise inspired six Sisters of Notre Dame to leave Namur and come to England. They came in response to a request by the Redemptorist Fathers who had set up a mission in 1843 led by Fr Louis de Buggenoms. On 8th November 1845 the Sisters left the Motherhouse and sailed to London, travelling on to Penryn by train and mail coach. When the Sisters arrived in Penryn they began to plan their schools and in January 1846 a poor school started with five children and two boarders arrived for the boarding school. By the autumn of 1846 there were over 80 children in the poor school and the Sisters were also running a workshop to teach a trade to girls and women and giving instruction in Sunday and night schools. The boarding school was struggling for survival though, and it was this fee-paying school for young ladies upon which the Sisters relied for funds for their work with the poor. In 1848 the foundation in Penryn transfered to Clapham, London. The Redemptorist Fathers had requested a foundation there and given the struggles of the community in Penryn, it was decided that the Sisters would relocate to Clapham. A day school was opened on 1st October and the boarding school in January 1849. The Sisters also taught in the poor school in Park Road established by the Redemptorists. An elementary school was built in the grounds of the convent after the move to Clapham Common. This school, St Mary's, completed in 1861, is still open. 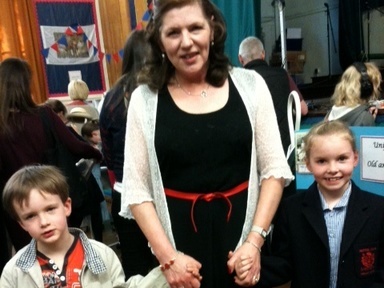 The Congregation continued to spread throughout the industrial areas and sprawling cities of England and Scotland. As new foundations opened, this same pattern of the early houses or one very similar was usually followed. A fee-paying day school was opened aimed at the middle classes of society and in some cases a fee-paying boarding school for young ladies. These schools, whilst teaching the same curriculum, had separate classrooms and teachers as the pupils did not mix with each other. At the same time as establishing these schools which would provide them with an income, the Sisters would open poor schools or work in established parish elementary schools. There follows a snapshot of just a few of the foundations. In 1850 a community in Blackburn was established. About a week after arriving, the Sisters began work in St Alban's school. There was a Sunday school and a day school. The poor school at St Anne's was begun about a month after they arrived. They also ran an evening school in the same room. The community moved to Brookhouse in 1859. 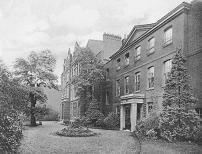 Upon moving building work was begun almost immediately for a large boarding and day school which was completed in 1862. New parishes were formed in the town as the numbers of Catholics increased and the Sisters were invited to teach in the elementary schools of St Mary's in 1871, St Joseph's in 1872, St Peter's in 1881 and the Sacred Heart School in 1901. The first Sisters arrived in Liverpool in March 1851 at the invitation of local clergy to take charge of St Nicholas' poor school. Their first house was no.3 Islington Flags, a small house with just eight rooms in which they housed the day, middle and evening schools which they opened. Larger premises were soon needed and in December 1851 no. 96 Mount Pleasant was purchased. 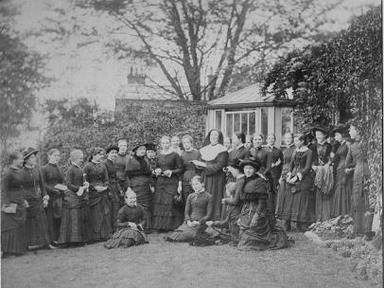 By 1895, fifty years after their arrival in Britain, the Sisters of Notre Dame had opened foundations in Penryn, Clapham, Blackburn, Liverpool, Manchester, Northampton, Wigan, Southwark, Sheffield, St Helens, Plymouth, Norwich, Birkdale, Islington, Battersea, Waterloo, Brixton and Glasgow. In the years that followed, more foundations were opened with the resulting schools. In many places the original fee-paying day schools evolved into direct grant grammar schools. 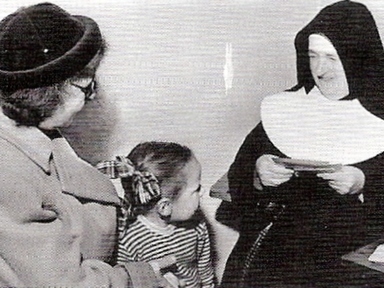 The Sisters were pioneers in opening pupil teacher centres. That the Sisters were able to establish so many foundations, and therefore reach and educate so many young girls, was due in part to the wealth that Sister Mary of St Francis (Laura Petre née the Hon. Laura Stafford-Jerningham) brought with her when she entered the congregation in 1850. She not only brought this wealth but also her administrative and management skills that enabled the foundations at Clapham, Mount Pleasant - Liverpool, Liverpool Orphanage, St George's - Southwark, St Helens, Blackburn, Sheffield, Plymouth, Norwich, Northampton, Battersea - London, Birkdale, Wigan and Everton Valley - Liverpool to be bought and built. From these early beginnings the work of the Sisters in Britain continued to spread embracing Primary, Secondary and Higher education throughout England and Scotland and child guidance clinics in Glasgow, Liverpool and London.